Receive right in your inbox. Subscribe now! We begin the year with Mother Goose Rhymes to effortlessly give children the rhythm and sounds of the English language and to introduce them to “Just Right: I Can Read!” Little Books which they can use during “Read to Self” Time. Marie Clay’s research reminds us that “Rhymers are readers.” Using classic Mother Goose little books is a research-based approach to simultaneously build phonemic awareness, oral language fluency, reading skills, and delight! How Do Master Kindergarten Teachers Close the Reading Achievement Gap over the Summer? 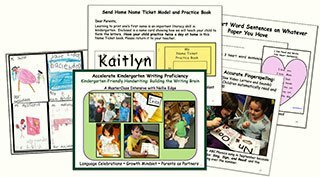 A Follow-up to Kindergarten Handwriting Matters! We are delighted with the response to our first article: “Kindergarten-Friendly Handwriting Matters!” on our new monthly kindergarten blog Joyful Pathways to Accelerated Literacy! This is a follow-up FAQ in response to many emails and questions.